So you landed all the way to know our story, right? Well, first things first! 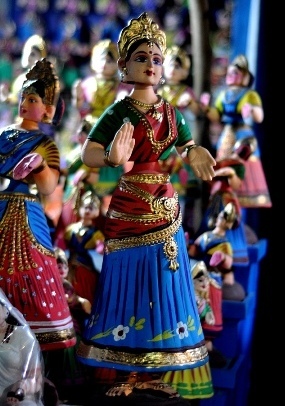 We are designers and makers of Bobble Heads and figurines based on India. Our first range includes collectible bobble head figurines of National Leaders, fictional character look-alikes of Bollywood stars and the very popular sports stars of the country. Looking to expand our realm, we have been working on famous comic characters and even fictional character creation. Out of Raj’s love for small-fun-things-collectible was born the idea of India Bobbles. And once shared in the household there was no looking back. We just loved the idea of creating these amazing lil things ourselves. Our very first piece was for us to savour. Later came the making loads and selling part. Actually, we just adore small things. They may not matter but they are the things that count. After all they take up less space and possess the power to bestow happiness and inspire big time! While randomly browsing through amazing collectible hubs like Royal Bobbles, Funko and NECA we thought why could we not own a piece of our favorite hero/celebrity in the form of a miniature or the most popular 'bobblehead' format? So, we decided to branch out of Rudra Softtech LLP (Raj’s Software Company) and make these lil-things-fun for our fellow Indians to buy. The idea might seem to be coming from the west but we are pretty sure our world famous Tanjore Dolls gave birth to the concept. Remember the dancing mitti ka lady we bought home for Diwali? One could say, we took the “I wanna take you home” idea quite literally! I mean tell me you have not felt the need of keeping to yourself, a piece of your favorite hero, super-hero, zombie or any creature for that matter? Just by the side, to play, to talk to, to get inspired by...Aah !!! And that’s the kinda joy we strive to bring to you. Each piece coming from India Bobbles is hand crafted and hand-painted to perfection because each piece has a story to tell…personal, historical or even a brag! So who was blah-blahing about giving happiness and inspiring big time? We all want to do that, at some point, for some special ones. Then why just buy any gift and get it over with? Grab one (or a collection) of our insanest collector's delights and give a loved one (including you) a thought to remember! Inspiration and happiness for keeps! Go ahead, your inner child will jump for joy.